Message summary: There are many paths in life that beckon us. But spiritually there is only one path that leads to spiritual and eternal life; the path of righteousness. “The heart is deceitful above all things” (Jeremiah 17:9). “In the path of righteousness is life, and in its pathway there is no death” (Proverbs 12:28). “Listen, my son, and be wise, and keep your heart on the right path” (Proverbs 23:19). We have a country path we have often walked on since moving to our current home in April, 2002. It’s actually “Meeting House Road”, still an official township road that has long been abandoned and overgrown which is OK by us. We like to think of it as our personal path. 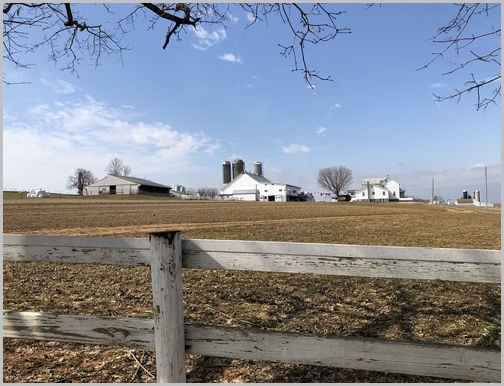 As the weather warms up we will be making our local walks along this pleasant path that begins right across from our home. 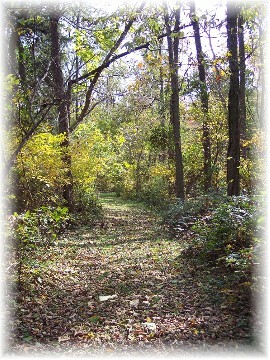 There are many paths in life that beckon us. But spiritually there is only one path that leads to spiritual and eternal life; the path of righteousness. There are many other paths that ultimately lead to death, however pleasant they may temporarily be, along the way. An example of sin’s deceitfulness is the way it takes hold of our lives when we’re guided by our feelings rather than the absolute truths of God’s Word. The writer of Proverbs 14:12 put it this way: “There is a way (path) that seems right to a man, but in the end it leads to death.” The Lord Jesus said, “I am the way and the truth and the life. No one comes to the Father except through me” (John 14:6). “Listen, my son, and be wise.” The writer of Proverbs is referring to listening to God’s truth, the only truth which will make us truly wise. This wisdom speaks not only of head knowledge but also heart knowledge and godly understanding. This wisdom is not a result of any degree of innate intelligence or formal education as the world reckons it. In fact there may be absolutely no correlation between these characteristics and attaining godly wisdom. Worldly wisdom is summed up in Romans 1:22, “Although they claimed to be wise, they became fools”. “Keep your heart on the right path.” For all of us who earnestly seek to follow Christ this is a simple seven word phrase to keep before us each day. There are so many distractions and disturbances that seek to get us off the right path. We need to listen intently and obey the Voice of Truth. We can hear this voice through the Holy Scriptures which are able to make us wise for salvation through faith in Christ Jesus (see 2 Timothy 3:15). We conclude our message with one more Scripture verse that supports today’s emphasis; “Above all else, guard your heart, for it is the wellspring of life” (Proverbs 4:23). “But the Voice of Truth tells me a different story. The Voice of Truth says ‘Do not be afraid’. And the Voice of Truth says ‘This is for My glory’. Out of all the voices calling out to me. Daily prayer: Father, may the choices I make today reflect the Voice of Truth that points me in the way of life everlasting. If I should instead choose to go by my feelings about a matter I am sure to make a mistake I’ll later regret. But when I follow Your commands, they are not based upon the feelings I have now that could change later, but they’re based upon Your immutable truth intended for all time. Help me to be wise, strong, and obedient so that I will keep my heart and life on the right path. Amen. Brooksyne’s note: Some of you will recall the very popular and beautiful song of the 70’s “You Light Up My Life.” It has a troubling line that has always bothered when I hear it; “It can’t be wrong when it feels so right.” It’s a good example of the way sin takes hold of our lives, when we’re guided by our feelings rather than the absolute truths of God’s Word. The song was written in the seventies when we were young but now we have encountered a lot of people along the way who do make their decisions based upon their feelings rather than on what is right, particularly in the area of marital infidelity. 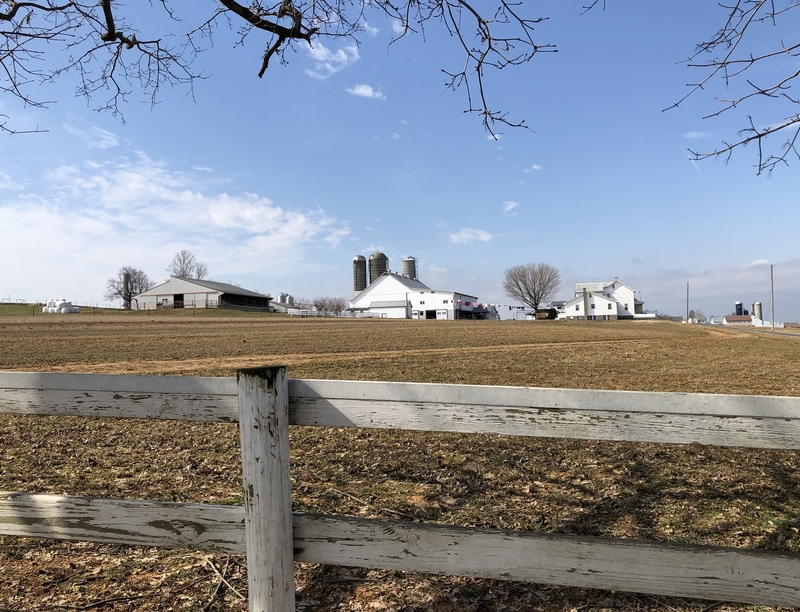 Brooksyne’s second note: Last Friday Stephen and I joined the children in an Amish one room schoolhouse for lunch. Anna Ruth provided hot sandwiches, we provided sodas, and Ester provided cupcakes and a vanilla frosted cake. We never fail to be blessed by the diligent “scholars” at the school – eight grades in the same room working together, playing together, and learning together. This year’s class has 20 students and an 18 year old teacher. The children are so well behaved and very bright. We stuck around as guests and watched all the children play softball together, listened to them sing hymns and choruses, watched as sever did their math and spelling on the large chalk board, 2nd graders read aloud, many worked individually at their desk, and others promptly answered the teacher as she threw out question after question. For example the second graders were asked a lot of questions including this: How many cups in a gallon? I had to do some math in my head but Lizzy answered immediately. Since there are 4 cups in a quart, and 4 quarts in a gallon I figured 4X4 = 16 cups. Here are some notes and photos from a similar visit 9 years ago. 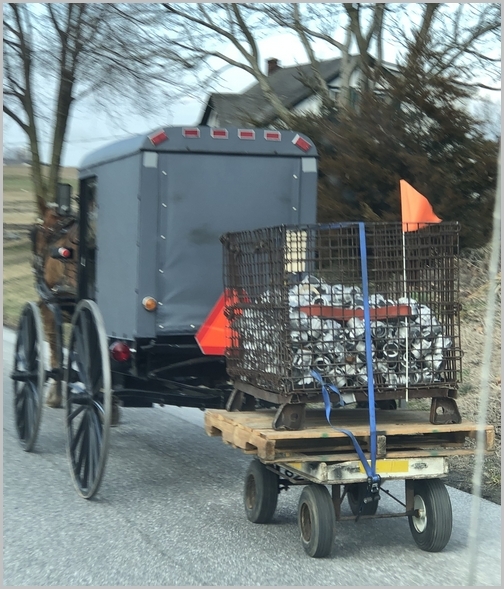 On the back roads of Lancaster County you never know what you will come across such as this Amish semi we passed last Friday morning. The driver was hauling a bin with some type of cast metal fittings, a heavy load, on a pallet on a small wagon. I would sure like to see better strapping for such a heavy load and the tires look kind of wobbly. It would be quite a mess and danger if the wagon tips or if there’s a tire blowout. But notice he did have the orange safety flag! 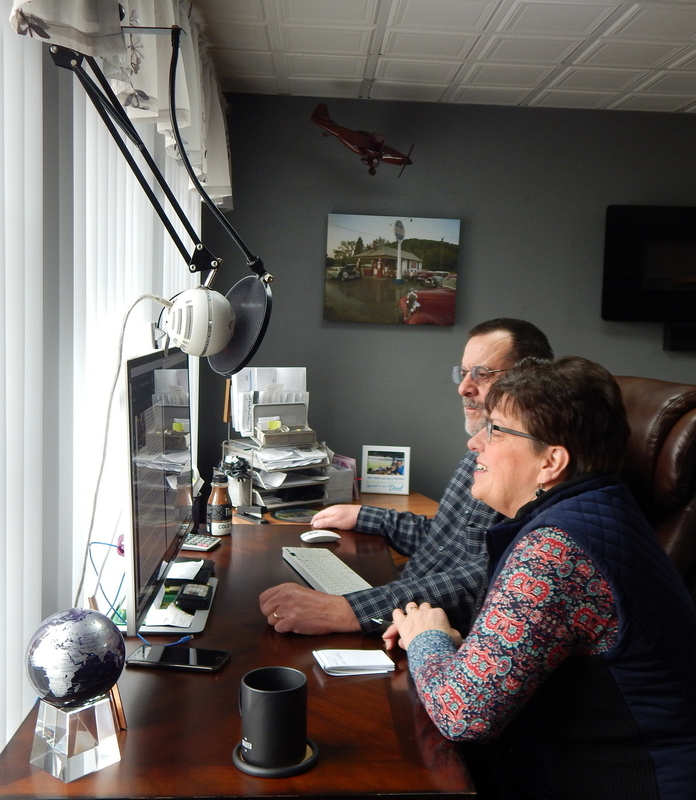 Jerry, a friend at work, asked about the recording aspect of our ministry so Ester took this photo of us yesterday. We podcast each message as well as sending 1 minute messages to WDAC, one of our local Christian FM radio stations. We make about 45 minutes to 1 hour of recorded messages each week using a USB connected Blue Snowball microphone and Acoustica Mixcraft Pro studio software. You can hear today’s message here. To listen to the daily messages click the “Listen” link right below the title. 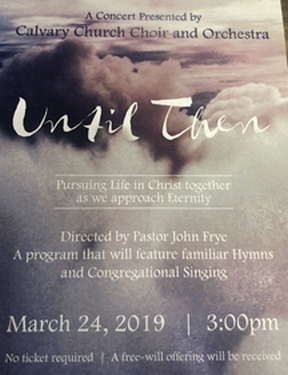 “Until Then” Concert: This coming Sunday afternoon at 3:00 PM the Calvary Church Choir and Orchestra will feature a concert with the theme of heaven. I (Brooksyne) have sure enjoyed our rehearsals and look forward to singing in this concert. 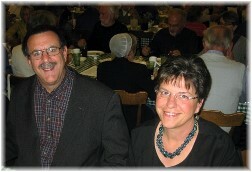 Selections include time honored hymns sung with the congregation and several newer selections with the theme of heaven. When I was a teenager “Until Then” was a choir number that we sang often in church and revivals. I never wearied of its message or tune, as a young person, and am thrilled to be singing it again in this setting since the words now seem more meaningful than in my youth. I still attend many concerts aimed at the younger crowds and enjoy them, but I’m also glad for a concert that has the older generation in mind. I hope locals can come out and be blessed by this concert. Come early because it will likely be very crowded. We will be singing “Until Then” so here’s a video by Jason Crabb singing this beautiful song.